Non-healing chronic wounds are a major complication of diabetes, which result in more than 70,000 lower-limb amputations in the United States alone each year. The reasons why diabetic wounds are resistant to healing are not fully understood, and there are limited therapeutic agents that could accelerate or facilitate their repair. University of Notre Dame researchers have discovered a compound that accelerates diabetic wound healing, which may open the door to new treatment strategies. 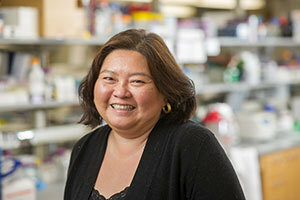 A team of researchers from Notre Dame’s Department of Chemistry and Biochemistry, led by Mayland Chang, previously identified two enzymes called matrix metalloproteinases (MMPs), MMP-8 and MMP-9, in the wounds of diabetic mice. They proposed that the former might play a role in the body’s response to wound healing and the latter was the pathological consequence of the disease with detrimental effects. The researchers used the MMP-9 inhibitor referred to as ND-322, which accelerated wound healing in diabetic mice. In a new study that appears in the journal Proceedings of the National Academy of Sciences (PNAS), the researchers report the discovery of a better MMP-9 inhibitor referred to as ND-336. The researchers are currently recruiting diabetic patients to ascertain the levels of MMP-8 and MMP-9 in their wounds. This study is in collaboration with the Center for Wound Healing at Elkhart General Hospital. The PNAS study can be found at www.pnas.org/content/early/2015/11/18/1517847112.abstract. Originally published by William G. Gilroy at news.nd.edu on November 23, 2015.